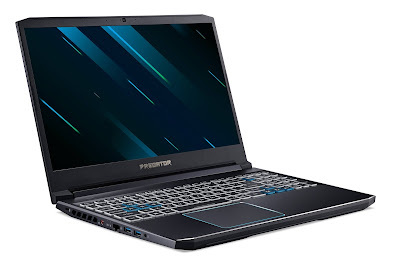 * The redesigned Predator Helios 300 continues to set the bar for midrange gaming notebooks with a bold new look and up to new 9th Gen Intel Core i7 processors, NVIDIA GeForce RTX 2070, 2060, or the latest GeForce GTX GPUs. The all-new Predator Helios 700 includes a unique HyperDrift keyboard that slides forward, allowing increased airflow directly through the top of the notebook, enabling gamers to push the powerful components to their highest potential. The redesigned Predator Helios 300 includes a sleek modern look and is powered by either up to an NVIDIA GeForce RTX 2070 with Max-Q Design, or the latest GeForce GTX GPUs, yet still retains its budget-friendly price tag. It’s well-suited for task-heavy computing, as its high-end hardware provides the performance needed for gaming, streaming, and video and photo editing. One of the Helios 700’s most interesting features is also incredibly useful. Its HyperDrift keyboard is part of the notebook’s thermal architecture, which consists of two of Acer’s custom-engineered 4th Gen AeroBlade 3D Fans, five copper heat pipes, a vapor chamber and Acer CoolBoost Technology. By simply sliding the keyboard forward, two additional air intakes are uncovered above the keyboard and below the display, giving the powerful heat-generating components extra air flow for maximum cooling and unleashed overclocking. The glass panel also provides a view of the notebook’s heat pipes. Keeping the notebook running cool and at peak performance is an advanced and efficient thermal design that unlocks the true potential of the Helios’s powerful hardware. Most critical to keeping temperature low is a dual-fan cooling system that includes one of Acer’s 4th Gen AeroBlade™ 3D Fans. This latest generation fan design was inspired by bionic silent owl flight mechanics that maximize airflow and minimize noise. The new 0.1mm-thin fan blades include a serrated edge, winglets along the top and bottom, as well as a curved fin along the inner portion of each blade. This results in up to a 45 percent improvement in airflow. Coupled with strategically placed intake and exhaust vents and Acer CoolBoost technology, the Helios 300 stays calm under pressure and handles intense overclocked gaming sessions with ease.